Western musicians started to favor the equal temperament as the tuning system from the Baroque period. However, the Arabian music retains the chronicle of notes with more than 50 tunes to record the cultural heritage left by Persians, Byzantines, Seljuks, Mongolians and Ottomans and the Arabs. An octave can be divided into 24 quarter tones. Even instrumental music plays games over portamento as if there is a built-in R&B musician wondering between merciless wars and freedom. On April 12 (Friday), clarinetist Kinan Azmeh and his CityBand will work with Syrian soprano Dima Orsho to showcase the authentic "Syrian Jazz." 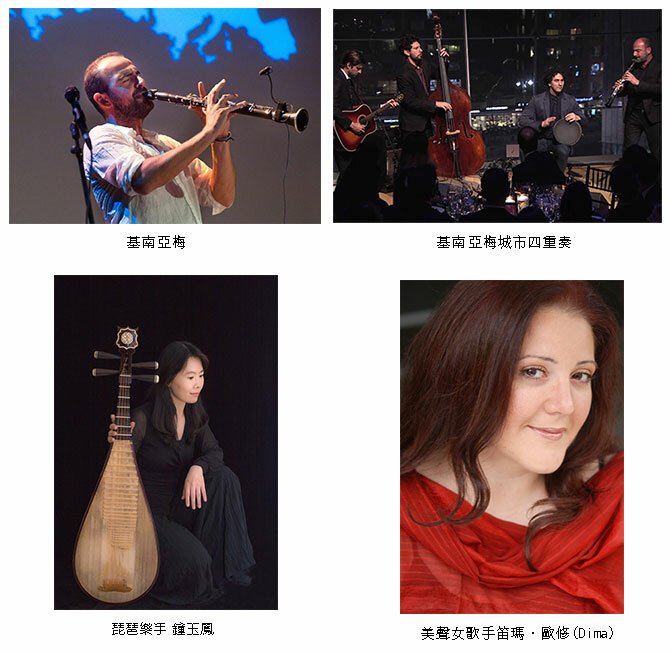 On April 13 (Saturday), he will collaborate with Taiwanese Pipa musician CHUNG Yu-feng to present Syrian music in the Damascus style. Dima Orsho will perform on the same stage as well. The program demonstrates diversified and infused styles of Syrian music, Jazz and Pipa. The stories told with music will make audiences feel exposed to the exotic atmosphere and heartily enjoy the music feast from Damascus. As a member of Yo-Yo Ma and the Silk Road Ensemble, Kinan Azmeh has been touring the world as a composer and clarinetist soloist with such world-renowned orchestras as the Bavarian Radio Symphony Orchestra, one of the favorites among the classic music enthusiasts in Taiwan, among others. He is also a member of Yo-Yo Ma''''s Grammy award winning Silkroad Ensemble. CHUNG Yu-feng is dedicated to integrating the Pipa, traditionally a solo instrument, into modern music landscapes. Pendulum, her latest album of her original compositions, ranked No. 3 on the World Music Chart Europe (WMCE) and is listed as a Gold Medal Winner at the US-based Global Music Awards. For presenting the best performance, the artist has not yet announced the details of the program. For the latest news, please check the official website of TIFA. ●Duration: approx. 90 minutes with an intermission.